Lidio Freitas was personally trained for over 12 years by Jaime Arôxa in all Brazilian styles – Brazilian Zouk, Bolero, Samba de Gafieira, Forro and Soltinho, as well as Tango and Waltz. Lidio owns a successful dance company and academy in Rio de Janeiro – one of very few accredited places to bear the logomark of Jaime Arôxa affiliate school. Together with his dance partner Monique Marculano, they were certified by renowned dancer Jaime Aroxa, whose dance company they were a part of. 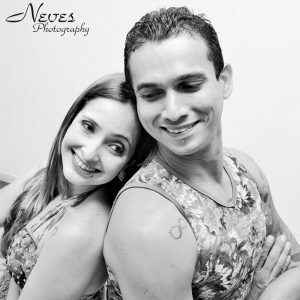 The couple are professionals in Brazilian Zouk, Samba de Gafieira, Bolero, Tango, Salsa, Rock and Forró. Recognized internationally for their style and professionalism, they have participated in several workshops and congresses in Brazil, Australia, the US, and Europe. Today, Lidio and Monique run their own dance school in Rio de Janeiro, Brazil.